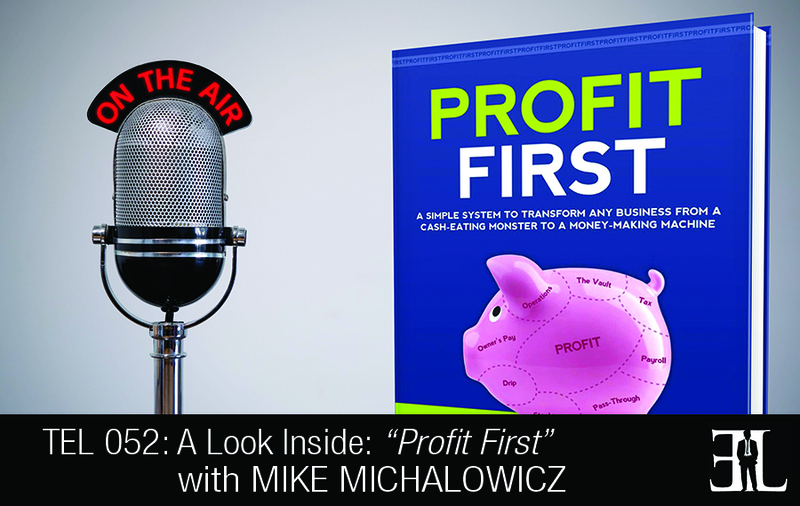 In this episode Mike Michalowicz joins us for a third time to share his latest book, Profit First. Michalowicz challenged the formula for business when it comes to profitability. In his book, Michalowicz shows you the correct formula for success as opposed to the original from Generally Accepted Accounting Principles of GAAP. He proposes a new formula about selling as much as you can, extract your profit from your business first and then pay your expenses with the remainder. His approach changes the entire paradigm. This book is perfect for all entrepreneurs who have based their businesses profitability on the formula of sales minus expenses equals profit. By taking the advice from this book, there will be less money for expenses, your behavior will change and you will find ways to get the same things done with less money. Every book I have read to this point has talked about Generally Accepted Accounting Principles (GAAP) which is the formula that businesses base their profitability on. I challenge this formula and say it is totally flawed because profit is the leftover or after thought and it’s the worst formula for the way our minds work. I propose a new formula about selling as much as you can, extract your profit from your business first and then pay your expenses with the remainder. This changes the entire paradigm. This is a beginning to end book. You start at the beginning and there are action steps at the end of each chapter. Hands down it is flipping the formula of sales minus expenses equals profit or sales – expenses = profit. This formula does not work and hurts your business. I want people to take home the new formula of sales minus profit equals expenses or sales – profit = expenses. By taking your profit first there will be less money for expenses, your behavior will change and you will find ways to get the same things done with less money. In the book I go over the four principles of Profit First. I found that in the fitness, health or diet industry there are four core principles and these four principles translate into a healthy business as well. The first principle is about the intake of fewer calories. The diets and extreme workouts don’t work because they aren’t sustainable. The one way dietitians found very successful is simply by changing the size of the plates at your house. By getting smaller plates you now get to leverage your habits and that little change has a huge impact. In our business we have to realize that we have one massive plate called the checking account. All of our money goes in there and all our bills get paid out of this one account. The strategic step we need to make is to have multiple small plates which will reduce the size of that account for expenses, spread the money out into small plates and by doing this you see that less is available and you consume less for expenses. The second step I leaned was to eat your vegetables first. In the health industry they found that most people eat their food simultaneously and most of the time that means the vegetables get pushed aside and never eaten. If we simple eat your vegetables first you’ll get the nutrients and vitamins from it and take in fewer calories. In business we do the same thing. When money comes in our account the very first thing we should do is spread it out to different plates and then the leftover should be used to pay expenses. By doing this you’ll have less money for expenses and you will be more likely to spend less on expenses. The third step is to remove temptation. In the health industry they say that if you like soda, the best thing to do is not have any in your house. In business when we have our profit reserved the first step is to take that profit, transfer it to a second bank and now with the profit removed you are less likely to borrow or steal from yourself. By doing this you will feel more pressure to cut your expenses and make sure they fit in with the amount of money that is left over. The final step that is taught in the health industry is our eating frequency. Most people eat too infrequently and the optimal amount is five small meals a day instead of three big ones. In business we need to establish a rhythm of going through the process of paying bills about twice a month. If you do this you see money come in piling up as income and then you allocate and pay your bills. I am an author targeted toward small business books and how to grow them to be successful and competitive in market. I challenge all the beliefs that are out there about growing a business and study other businesses to find the current formula for success. After selling my second company I thought I knew the formula to success and became full of myself. I decided to become an angel investor, took my own money and started 10 companies and threw money at these businesses believing that the only thing that mattered was my involvement. This ended up being a train wreck and caused me to lose basically every penny I put in it. The day I lost my last penny became a defining moment for me and the realization that what I thought was the formula to success was in fact wrong. I thought that profit was an event and I became to realize that profit is not an event, it’s a habit.